March 27, 2014 by Susan G.
In The Compassionate Equestrian Dr. Schoen and I stress repeatedly that when a horse exhibits behavioral issues, first rule out pain as the root cause. This is especially true if there’s a change in the horse’s base personality. Sometimes this takes more than one veterinarian’s opinion. Diagnosis of subtle lamenesses can be difficult to pinpoint and the first sign of a problem might be the new or increasingly difficult behavior. However, in my many 30+ years of working with all kinds of horses of varying breeds, ages, backgrounds and temperaments, there are a few quirky personalities in the crowd that are simply, well, weird. They have legitimate behaviors that are out of the context of “normal” for most horses and sometimes the most compassionate thing to do is let them be exactly as they are. If you can hang on, or tolerate them that is. Sometimes you just hold on! Some of the most interesting have been the off-track thoroughbreds. The subject of this post is one little, classic, plain bay gelding. 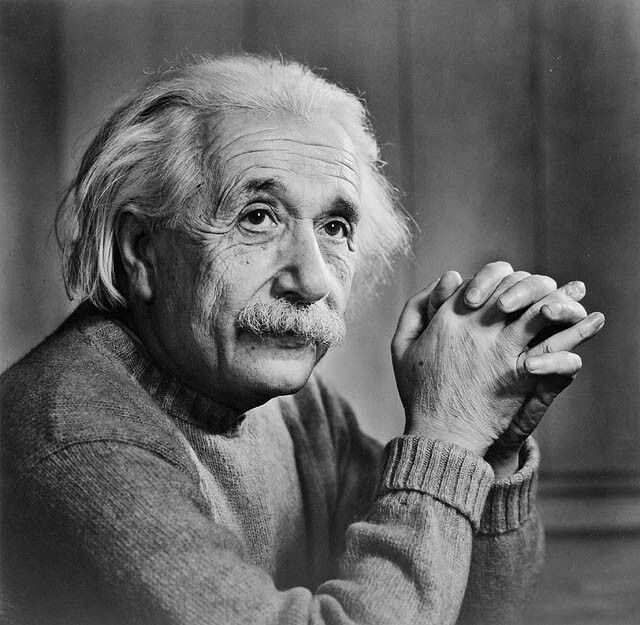 Nothing particularly spectacular to look at, but he had the kind of personality that made everyone look. Kind of in the way you can’t take your eyes off the cars in a demolition derby. His name was Earthquake. As the story went, he was born in California during an actual earthquake. We never did confirm whether or not this was true. He was booted off the track in San Diego due to his “bad behavior”. 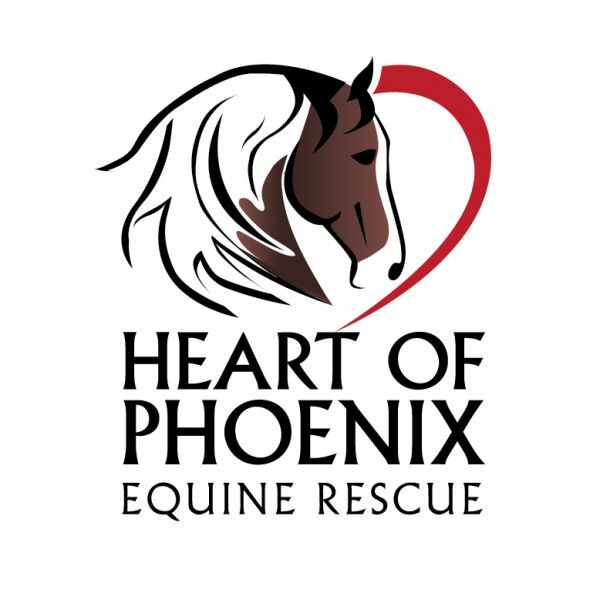 He ended up in a backyard in Phoenix that housed the other off-track thoroughbred jumpers belonging to his owners. Besides a string of successful racehorses, they had produced some of the top amateur jumpers on the circuit. Earthquake’s owner, Tracy, is the sister of the trainer I was working for at the time. She told us “Quake” was almost impossible to ride on the flat. Even with all of her experience in showing and winning at the “A” Circuit level, this little bay gelding scared her. He would scoot out from under her, spin, leap, and generally act like a crazy horse. She didn’t know what to do with him. One day he was turned loose in the arena to play. Tracy watched, somewhat stunned, while ‘Quake galloped over jump after jump all on his own, apparently inspired from watching her other horses school over fences. So she clung through the flatwork with him and began to train him for jumper classes. I had the task of helping her with him at his first show. Lucky me! I always maintained that somebody had to be the “entertainment of the day” at a horse show and frequently it was our barn. Tracy’s brother was an excellent, caring horseman and would never consider drugging a horse to calm it down or make it easier to ride. He just quietly rode whatever was underneath him in the moment, and so did his sister. Taking thoroughbreds from the track to their first few shows is always a wild card. ‘Quake was at least consistent with his quirky behavior. I watched the crowded warm-up arena from the barns and it was easy to spot him. That would be the horse and rider leaping above all the others, unrelated to where the warmup jumps were placed. He was so excited to go in the show ring for his rounds, he couldn’t be contained. He would paw, stretch, almost drop himself to the ground, spin, leap, and spook other horses at the in-gate. Tracy hung on. Then he would go in the arena, focus, clear every jump, and won almost every class he was entered in. He was phenomenal. Just impossible outside of the jumper ring! He got better at his routine as he began to get the hang of showing. I had to tack him up before one of the classes and it was exhausting. He spun around in the stall. He couldn’t stay still for a second. I even tried pressing on an acupressure point on the coronary band, in the center of a front hoof. It actually seemed to work, much to my relief. He calmed down and I finished getting him saddled for his class. Another day, and another class. We got him tacked up and Tracy left him tied in his stall to go walk the course. ‘Quake knew where she was going and he was apparently upset that he wasn’t going to the jumper ring with her. I went in the tack room for a moment when I heard a loud crash from ‘Quake’s stall. Mortified, I saw that he’d somehow jumped over the stall guard while still tied to the inside of the stall. I have no idea how he could have maneuvered his body in such a way through a small opening and over the barrier. Luckily he was unhurt in his desperation to follow his rider to the arena. All you can do with that kind of enthusiasm is support it and hope the horse connects with the right rider and the right activity to accommodate his energy and ability. In this case, the stars lined up and what would have been an extremely difficult ride for many equestrians, turned out for the best. Last I heard ‘Quake was winning Grand Prix classes in the southwest. Not every horse with behavioral “quirks” is lucky enough to find its way to a compassionate, competent owner that has the patience to simply let him “be” and allow the talent to shine through. If ‘Quake had been punished for his leaping and spinning who knows what kind of a different horse he may have turned into. Most likely not such an enthusiastic jumper who seemed completely enamoured with his owner. If you have been able to rule out pain as the cause of your horse’s “behavior problem” and have determined he’s just of the personality type to be the way he is, then kudos to you for your compassion and understanding. In my mind, I can see the happy little grins on all those clownish horses out there whose joy for life just can’t be constrained. March 21, 2014 by Susan G.
Many times when I’ve asked people about their horses they’ll say, almost apologetically, “oh, he’s just a trail horse”. It’s as though their horse isn’t important enough for those of us who made a career with show horses to acknowledge as being relevant. Or that it doesn’t require any special breeding or talent to be a trail horse. Well, in the Principles of Compassionate Equitation, we see equality in all horses, just as we do all sentient beings. They were given a life, just as we were, and all are subject to suffering, just as all humans are. Everyone deserves the same amount of compassion, no matter who or what they are, or what they do. Including trail horses :). 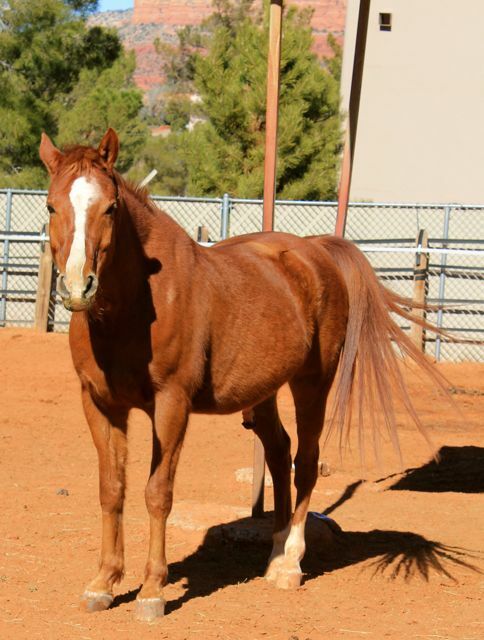 Recently I had the opportunity to spend time in one of my favourite places, Sedona, Arizona, on the back of a sweet, reliable trail horse who is as careful and kind as they come. 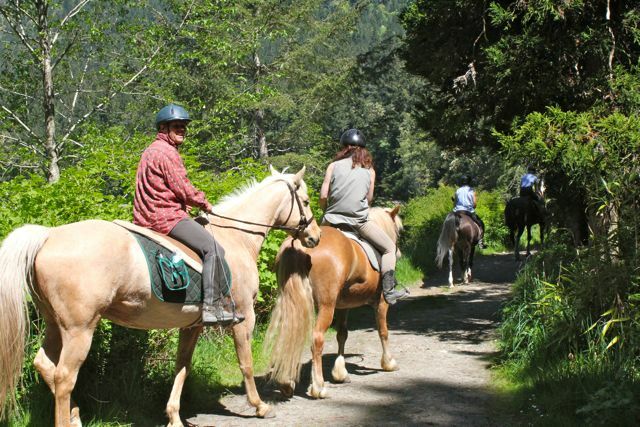 This is significant because my past experience with horses on trails has not always been so favourable. My first horse, White Cloud, was a ranch horse. When we moved to the suburbs of a large city, I had to ride along busy roadways to reach the trail system. I was only twelve at the time and didn’t know better. I thought that since the stocky white mare was so good on country trails, nothing would bother her on busier roads or trails either. How wrong I was! I was lucky we weren’t hit by a car. We held up traffic a few times while Cloudy panicked at the sound of loud, fast vehicles passing and spooked by throwing herself into reverse. As the area we lived in was lined with large ditches, her behaviour was quite disconcerting, not to mention dangerous. Her tension translated into my tension and I was forever nervous about riding horses along busy roads after that. I’ve never really gotten over it. When we moved again, Cloudy was sold to a rancher and lived out the remainder of her life in a happy place. The next horse to come my way was a very young, barely broke (in fact, badly-broke) appaloosa filly. She was also born and raised on a large ranch and had no concept of behaving on multi-use trails or in traffic. I really tried to overcome my fears and hers as I still enjoyed a gallop across a hay field or a pleasant trail ride down to the river, which required some riding along roads to get there. Miss Demeanor, appropriately named, was one “incident” after the other. I was still in my early teens and learning about training horses. Determined, I kept taking her on trail rides, hoping for improvement. One day she managed to thoroughly embarrass me on a group ride by running backwards down a steep hill until she finally backed into a tree, even with the reins thrown at her. Then she scared herself and scooted forwards, spooking some of the other horses who had gone ahead. I just seemed destined to not ever have a pleasant trail ride! One day I was finally brave enough to ride “Missy” the few miles down to a beautiful spot by the river. I let her take a drink out of a creek that fed into the river and in the blink of an eye, she was down and rolling in the muddy bank with me still on her. I had to ride all the way back to the barn with one side of her plastered in mud so thick you couldn’t see her spots any longer. I never did get all the mud out of the carved leather of my western saddle either. I was in awe of people who could simply saddle up on a nice day, head out on the trail, and return still smiling with a happy and relaxed horse. I had no idea why this “trail horse” thing was so elusive! There was no problem in the show ring. Even my spooky filly could open gates, walk over teeter-totters and tarps, drag a tire or a cow-hide, and jump a small fence. Why didn’t that translate to the great outdoors? Eventually I gave up on the idea of enjoyable trail riding, especially as my next horse was an appaloosa stallion, and confirmed “city boy”. The first time I led him down a little hill he had no clue how to navigate it and promptly squatted on his hind legs and sat there in a half-rear. I should have expected such things from my horses by now. One day I was offered a beautiful big dappled gray warmblood gelding to ride on a charity trail event. He was a lesson horse at the show barn I was riding at and generally very quiet. Oh no, not on the trail however. He spooked at… invisible trolls? Maybe it was the shrubbery. Finally I was married to a three-day eventing trainer and we were running a barn that was situated next to a cross-country course and thousands of acres of trails, accessible without riding along any roads. Surely this was to be trail-riding heaven! Sigh. The appaloosa complained about the rocky footing. The thoroughbred gelding pranced sideways thinking he was still a field-hunter and wouldn’t settle until after a full-out gallop. The off-track mare spooked at the cattle. The part-Standardbred jumper bolted over the beaver-fall. Was there anybody out there who wanted to be a nice trail horse??!! I was starting to resign myself to having to ride in an arena forever, or continue having unusually adventurous trail experiences. Gee, what was it like to have a safe, relaxing ride where I could drop the reins and enjoy the scenery? The last barn I taught lessons at was a mix of many types of horses and riders, most of whom went on the rugged, rocky trails of Sedona on a regular basis. I was still more comfortable jumping fences than going on a trail ride and stayed in the arena. Finally, having really retired this time (it took a few tries), I thought I’d attempt trail riding again. I know those trails from having run them on foot. 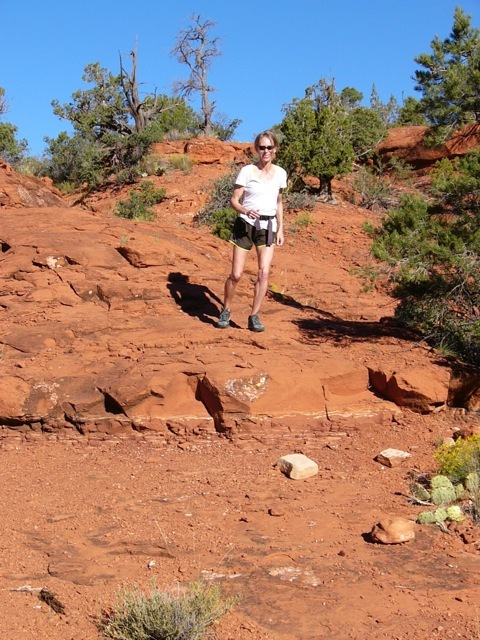 It’s very easy to twist an ankle or trip and there are many hazards on desert pathways. Sharp cactus plants await along every edge and the rocks can roll underfoot or be as slick as ice when worn smooth by eons of erosion. Deer or javelina can appear out of nowhere and in the warmer months there’s always the possibility of a rattlesnake coiling closely enough to do some damage. Remembering to breathe, at first I guided Shadow, the pretty chestnut Arabian gelding, as I would in the arena, “helping” him negotiate the continually changing angles of the terrain and hoping he wouldn’t slip on any of the slick-rock. I worked as hard as he did, staying off his back on the uphills and shifting a little rearwards on the downhill, monitoring his balance and speed. Hoping not to annoy him, I tried to do as little as possible, telling myself he knew what he was doing. He’d spent many more hours packing riders around these trails than I had spent riding horses on them. Shadow was also lovely in the arena, and in fact very well bred to be a show horse too. His gentle disposition and good training seemed to add up to his ability to be an all-around great guy. At the end of our 3-hour ride, my reins were loose and I was letting him pick his way home, carefully stepping over boulders and not tensing up when his shoes slid on the steep downhills. Yes, this little horse knew what he was doing alright. What a happy day. Now I know what it’s like to have a genuinely pleasant trail ride, with no spooking at wildlife, cars, dogs, cyclists, or loud noises. What a special horse it takes to provide that kind of experience. I can’t believe I had to wait so many years to enjoy such a ride. I can tell you for certain that nobody ever needs to apologetically refer to their horse as “just” a trail horse. They are a special breed unto themselves, no matter what their breeding or background, and they deserve every accolade that a top-notch show horse receives. Trail horses also deserve the same kind of mindful care, compassion, and healthy environments as the most expensive, highly bred animals in the show-ring. After all, horses don’t know how much we paid for them, or how much we pay for their training and board. All they know is how they are made to feel in our presence, and you really can’t place a dollar sign on that. March 9, 2014 by Susan G.
Many years ago I was living at an FEI-level dressage barn as the assistant hunter-jumper trainer. It was a fabulous place to watch and learn from some of the world’s best and most educated riders and clinicians who came to ride, teach and show there. I’ve learned throughout my years as a professional rider that those rare horsemen who are consistently at the top of their game in the Olympic disciplines are also the quietest. They tend not to talk a lot and have dropped the egoic bravado that comes with so many trainers who are still out to prove themselves. Getting specific information out of them isn’t always easy… more likely gained by observing and the occasional politely asked question. One day I was watching the head trainer, a soft-spoken, elegant German master rider, schooling a working student on an upper-levels horse that had been allowed by its owner to make flying lead changes incorrectly. Every other canter stride or so the student-rider would ask for a lead change and the rangy warmblood gelding would swing his haunches well off the track to the left or right. 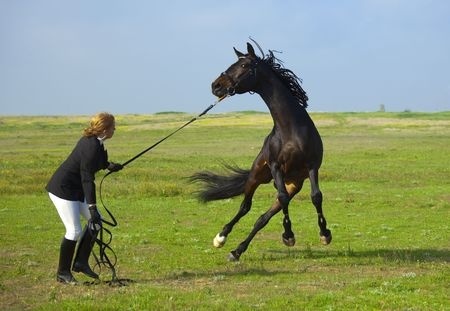 It looked awkward, and in fact, such swaying off the track results in a relatively low score in a dressage test due to the incorrectness of the movement. It also indicates a resistance in the horse and would eventually lead to unsoundness. The trainer spoke in German – a language I don’t understand beyond a few words – and the next time the series of flying lead changes were attempted they appeared nearly perfect. Surprised, I asked Uli, the trainer, what he said. “I told him to keep the horse straight” was his answer. The difference a subtle change in the ride made to this horse was such a profound lesson I wished I could have had a video camera in my hand at the time as the teaching from this one apparently simple thing was quite dramatic. However, it’s the right combination of so many elements, including the keen eye and years of experience of such a trainer, plus a student who also came from the program in Europe that made the rapid change in the horse’s form look easy. 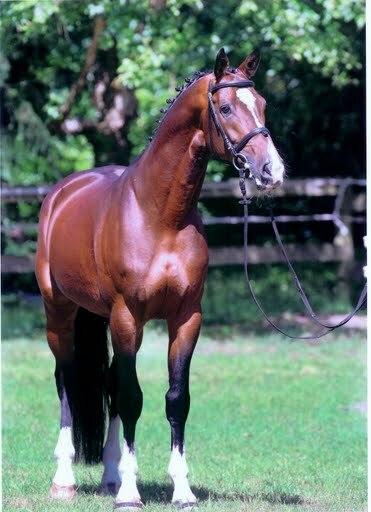 Candillo Jr, an imported Holsteiner stallion, now owned by OSJS Sporthorses of Canada. In the classical training method the two key words that lead to a healthy, “finished” horse are deceptively complex. If it were a simple matter to ride a horse both forwards and straight, we’d all be riding relatively problem-free horses that stay as sound as possible and carry a rider without stress or discomfort. Unfortunately, especially in North America, there are only a handful of trainers who still follow the programs of master trainers and not too many riders who have had the opportunity to sit on a horse that has reached a perpetual state of “forwards and straight”. Horses naturally track with their shoulders closer to the rail and haunches more to the inside due to their shape. If you look at a horse from the top view, you’ll see the width of the shoulders is narrower than the hips, so it’s just a more comfortable and natural way for them to track. It also means they naturally drop an inside shoulder as they make a turn and counter-balance by shifting their heads & necks to the outside. Running free without a rider, this is fine for the horse, as there’s nothing to upset their balance and muscular development. The moment we humans climb aboard however, we have to undertake a proper series of exercises so the horse builds up a correct athletic form and the musculature to be able to carry a rider through all of the movement we request of them. It’s at this convergence point of “natural” vs. “training” that we seem to have broken the smooth process of the classical training pyramid as too many horses are pushed too quickly through the levels, whether they be destined for dressage, jumpers, or other show disciplines. Very few people who have the time and money to support show horses also have the patience to wait for a horse to develop correctly through lower levels. Depending on the breed and conformation, some horses never progress out of a basic level of training, yet should still be given the opportunity to have a genuinely correct base that instills rhythm, suppleness, and a willingness to take contact with the reins. In the “old” classical system, a horse is never punished by being ridden in reverse – i.e. pulled on or jerked by the reins – and the standard that was taught is to “correct forwards”. This works for both exciteable and lazier types of horses, and all breeds and disciplines. Even a good western lope has to be forwards and straight and is an art unto itself. Not all horses can achieve a good lope, even the ones bred for it. Same with an extended canter for a warmblood. Not all of them will get there. A horse that is ridden forwards, what we refer to as the “back to front” ride will develop an increased bend in the joints of the hindquarters, allowing for more freedom of the joints, which also helps keep them lubricated and healthy, and allows for the muscles of the lower back and haunches to develop “pushing power”. This is different from rushing, as that’s a balance issue. A good illustration of the difference is to hold a dumbbell in each hand. Bend your knees and hold the weights with a bent arm, fairly close to your body. You feel strong and balanced. Now lean forwards a bit and hold the weights in front of you (careful – don’t get hurt!). You’ll immediately feel the stress in your back and want to take a quick step to keep your balance. Horses experience the same thing when all of their weight is carried in the forehand and not transferred to the hindquarters. So far as straightness goes, look at a great athlete. Skier, skater, runner, etc., and notice the body symmetry. Straightness means efficiency and optimal performance. It’s no different for horses. When you ride a horse that’s been trained to go straight it’s like the difference between driving a high-performance sports car compared to an old 3/4 ton pickup truck with manual steering. Unfortunately, finding a straight horse to ride so you can experience that difference for yourself is not always an easy thing to do. If all riders had the opportunity to learn on this type of horse, we’d have a lot more sound, rideable schoolmasters in teaching programs than we do now. Dr. Schoen treats horses repeatedly for musculoskeletal misalignment and subsequent pain that is frequently a side-effect of incorrect training methods. I’m barely even scratching the surface here on the concept of “forwards” and “straight” as the training techniques and level of experience required to get a horse there would take up volumes of books and many years of study. Yet, out of compassion for our horses and knowing how beneficial a correctly trained horse is to the equine world, isn’t that kind of worth the time and trouble it takes to learn?